Thoughts from Brahma Kumaris: Obedience takes one towards the right direction. 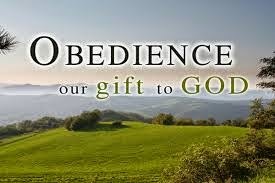 Projection: Obedience means understanding everything that comes one's way and allowing it to guide life in the right way - because nothing comes without a reason. An obedient mind is able to see the positive aspect and understand why there is that kind of a situation and humbly allows the situation to do its work. Solution: When I am obedient I am able to remain content and positive. I am not disheartened by low situations but understand that every low situation pushes me upward with greater force. So I enjoy being obedient and easy under all circumstances, yet being powerful within. Human beings have original qualities that are values which define our human and spiritual nature. The original qualities of each person are similar. The only difference is to be found in the intensity with which they are expressed. There are seven intrinsic qualities in human nature: peace, love, purity, happiness, power, bliss and truth. These qualities, that we all possess, are expressed in our life, relationships and activities in the form of different virtues. Any virtue that we express in our life and day-to-day interactions is not usually a unique quality; normally these virtues are a variety of qualities (listed above) that work together and express themselves. If we blend some primary colours, we get a wide range of colours. While we are expressing these original qualities in action, they mix together and become virtues. For example, patience is not an original quality of the self, but it is an important virtue, necessary for keeping calm in today's world. Patience possesses a little of the quality of love, wisdom and peace. If these original qualities are missing, in the sense that we have lost our contact with them, then impatience and irritability will arise. The virtue of tolerance requires inner strength, love and peace. From the moment we are born, we are subject to many negative influences from our family, society, religion, education, the media, culture, social class and ethnic background, that tarnish our basic values and often restrict our ability to express them in the form of different virtues in our daily actions and interactions. Spirituality helps us to revive these basic values.